This post has nothing to do with law enforcement analysis but I want to get it up on the Internet for anyone who might be interested. Perhaps it will be helpful to our friends in competitive or business intelligence (yes, I know they are very different things). I recently completed an analysis project for a client that ran an online contest. The contest was intended to generate leads for sales calls so it made sense to adopt a single-entry model for contest entrants (you only need a lead’s information once, after all). The contest was deliberately simple in scope and implementation running for a single month and eschewing instant win and daily prizes in exchange for a single large prize awarded in a random draw after the contest closed. Because the contest was focused on lead generation I felt it would be interesting to analyze and assess the quality of the leads. These are the findings. The contest ran for 31 days and received over 7,000 entries. The following chart illustrates the daily entry profile for the time frame of the contest. A few days after the contest launched, entries began to ramp up and peaked on the fifth day with over 1,000 entries. After the initial peak, there was a steady but decreasing cycle of entries until the end of the contest. Given the single-entry model of the contest the decrease in entries after the initial surge was expected. A notable feature of the entry profile is the resurgent spike of entries beginning on the day 23 that carries momentum through to the end of the contest. To understand this behavior it is important to know that the contest was run nationally for a Canadian audience and was therefore conducted in both our official languages: English and French. 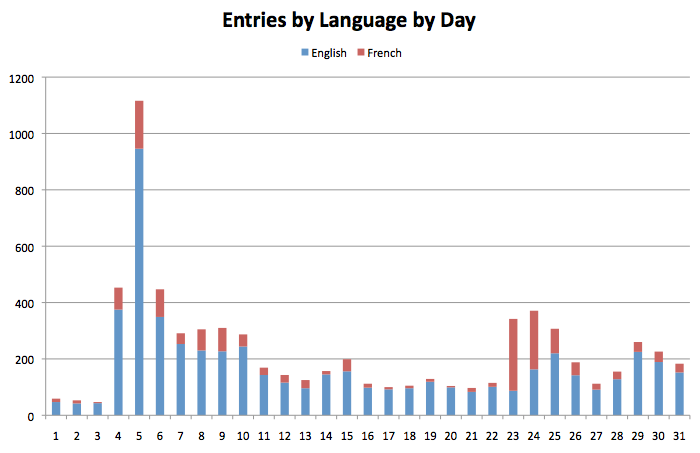 The following chart splits contest entries by language and reveals that the majority of the entries on day 23 and day 24 were made through the French version of the site and that the additional boost of French entrants is responsible for the observed pattern. While the initial spike in entries can partly be explained by a media buy early in the contest period it does not explain the later in spike French language entries. I wanted to determine what other factors might explain this observed behavior. Having developed contests in the past I speculated that the spikes could be connected with contest clearinghouse websites where enthusiasts who enter contests as a hobby meet and share information about new contests. use web-based tools to track which contests they have entered and to create reminders for such things as which contests offer once-a-day entries (so that they can remember, for example, to re-enter every day to maximize the likelihood of winning). To study the impact of contest clearinghouse websites on entries I analyzed traffic patterns from the contest website analytics and discovered that, for the contest entry page, eight of the top ten referring sites, including the top two, were identifiably contest clearinghouse websites (while the remaining two referrers were social media links and were likely contest-centric). While I expected a certain number of visits and entries in the contest would come from contest enthusiasts what these results indicate is that the contest page views were completely dominated by visitors coming from contest clearinghouses. At the top of the referrers list was contestgirl.com and extracting the daily referrals for contestgirl.com reveals the following traffic pattern. 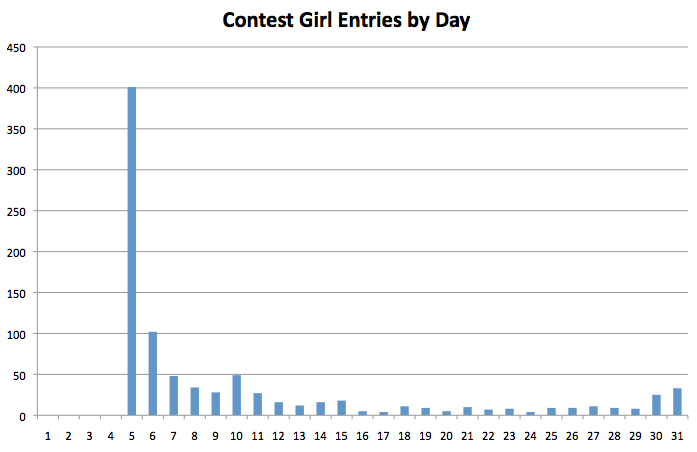 It is clear from this chart that on day 5 of the contest the contestgirl.com community became aware of the contest and sent a spike of traffic our way with over 400 unique visitors. 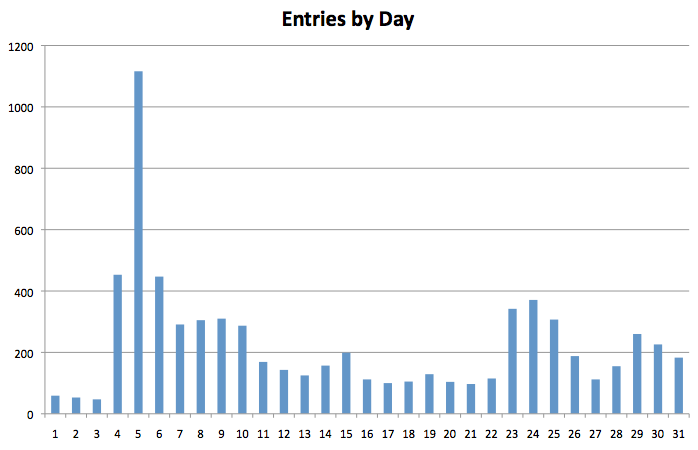 While the entry profile above reveals that peak, on day 5 the site had over 1,100 entries and an analysis of the IP addresses of entrants indicates that nearly 400 entries came from IP addresses with multiple entries (the only limited criteria for a ‘unique’ individual was that their email address be unique, many entrants entered several family members from the same computer) which implies that site visitors, which are only counted once, were very likely entering the contest more than once and therefore generating multiple entries. 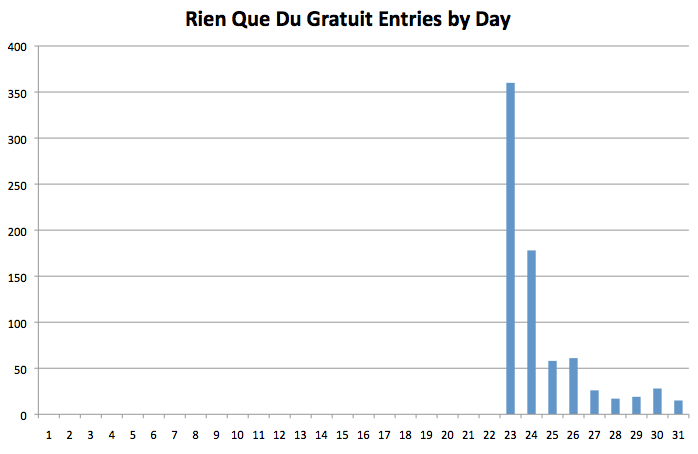 A similar analysis of website traffic on day 23 reveals that the number one referrer was rienquedugratuit.ca, a French contest clearinghouse, and their referral profile reveals a similar behaviour to contestgirl.com. Prior to day 23 of the contest there was no traffic from rienquedugratuit.ca and then a significant spike that continued to drive traffic until the close of the contest. The likely scenario again is that the contest clearinghouse first became aware of the contest on day 23 and drove its community to the site so that they could submit their single entry. The take away from both of these referrer profiles is the realization that the major peaks in contest entries are directly connected to spikes in contest clearinghouse referrals. The volume of referrals from contestgirl.com and rienquedugratuit.ca, while illustrative, are not unique. Web analytics revealed that fully 90% of the unique page views for the English contest page came from visitors that were landing on the contest page or who were, in other words, being linked directly to the contest (a common practice for contest clearinghouse sites). And while the volume of traffic on the French contest page was smaller the pattern of behavior and the proportion of directly linked visitors was essentially the same as the English site. These results indicate that the vast majority of contest page views were dominated by contest enthusiasts. Perhaps more damaging than 90% of unique visitors cutting straight to the contest page is the fact that 80% of the visitors to the contest thank you page (reached after a contest entry is submitted) proceeded to exit the site. This reveals that, for the majority, entering the contest was the only purpose for their visit. Furthermore, of the remaining 20% of thank you page visitors who didn’t immediately exit the site 17% returned to the contest page, presumably to attempt to enter the contest again. This means that the rest of the site content promoting the brand and various products was ignored by 97% of the contest page visitors. Other metrics support this interpretation as they reveal that the visitors who landed on the contest page spent an average of two and a half minutes on the site, which is just about enough time to complete the contest form. The analytics also reveal that those same users visited an average of 2.5 pages per visit (keep in mind that the contest entry page and the thank you count as two pages) which suggests that the majority of users landed on the contest page, entered the contest, and left while a smaller core of visitors, the 17% mentioned above, cycled between the contest and thank you page effectively driving up the pages per visit stat. Despite the high volume of contest enthusiasts there is one possible saving grace, and that’s if contest entrants honestly used the opt-in/opt-out checkbox for indicating whether they agree to further contact from the manufacturer. While 61% of contest entrants did agree to further contact this number is unfortunately suspect. There is anecdotal evidence to suggest that contest enthusiasts harbor a number of (perhaps founded) superstitions that if they do not “play the game” and agree to further contact they will be (illegally and unofficially) excluded from winning the grand prize. While this was not true for this contest the fact that such a high percentage of entries that clearly originated from contest clearinghouses agreed to further contact suggests that entrants were willing to chance a sales call in exchange for being counted as a compliant entrant. Unfortunately for sales people this practice further dilutes the pool of leads by burying legitimate expressions of interest amongst those entrants who have no intention of purchasing the manufacturer’s product but indicated otherwise. It seems clear, based on this analysis, that contest visits and entries were completely dominated by contest enthusiasts. Recognizing this, the first question that needs to be asked is: are entries from contestants connected with contest clearinghouses a source of viable leads? The problem as we see it is that hobbyists connected with contest clearinghouses enter contests because they enjoy winning prizes and when a product or service is free, the brand is a secondary concern. Essentially, they want a product when it’s free, but they want everything when it’s free, and their expression of interest should not be taken as particularly sincere. Would the type of people who enter any and all contests in order to win free stuff be amenable to a sales call to purchase your product? How many sales calls do they field as a result of their hobby and would they even remember that they entered a particular contest considering that their MO is to enter as many contests as possible? Finally, if the leads cannot be considered qualified are the names and phone numbers gathered through the contest any more valuable than simply cold calling the phone book? Based on everything I’ve seen, I’m forced to conclude that the quality of leads from this online contest, and any contest dominated by contest enthusiasts, is extremely poor.